Circle is a universal symbol representing the infinite, eternity, harmony and timelessness. As the sun, as the soul, as the encircling waters and as a circle of life: in the idea that the end of one’s existence is not necessarily the end of life altogether. It represents the oneness of life and all things contained within it, the spirit of harmonious co-operation, refinement of character and eternal embrace of unity. The concentric rings evokes a sense of universality, peace and connection between people across space and time. 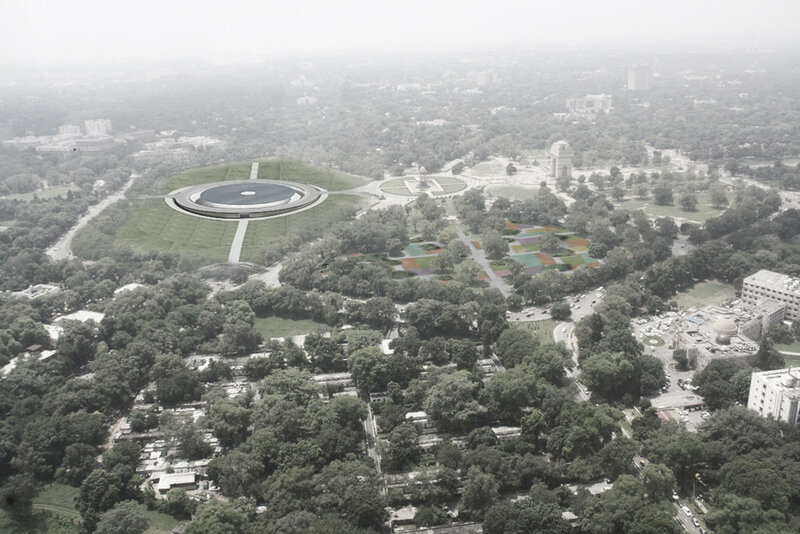 The circle defines the entire memorial, an emblem, a monument seen from the skies and seen from heaven. It is this timeless simplicity that will remain in one’s memory forever. The Memorial frames the ever-changing and infinite sky in many different ways. First as a reflection in the thin pool of water on the circular roof of the memorial, then as a ring of light along the Wall of Remembrance and finally as a surreal disc illuminating the Memorial through the oculus at the centre of the roof. The oculus will allow a beam of sunlight to wash the memorial space with its changing path during the course of the day. 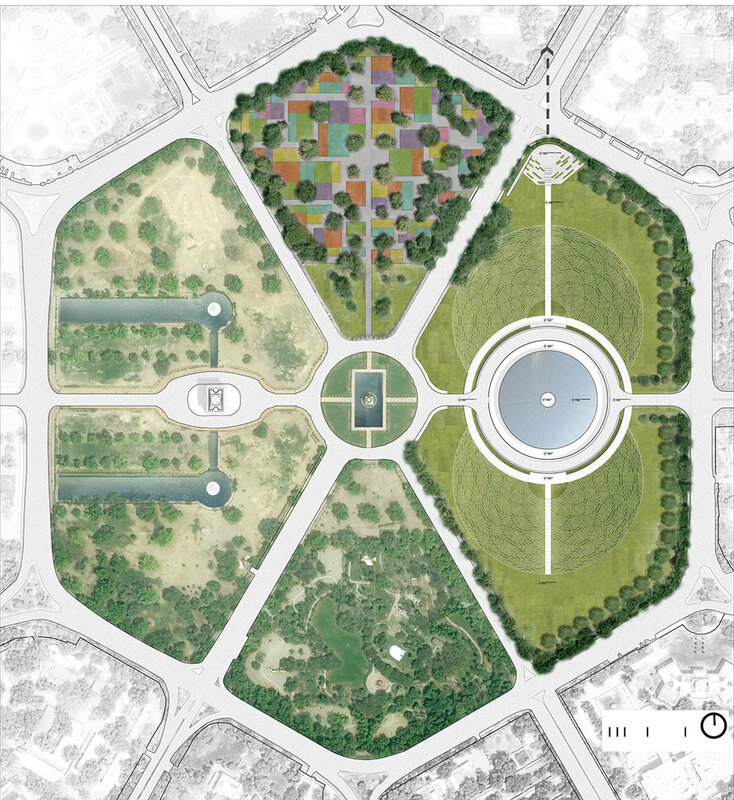 Through the course of a day and the year, as the sky transforms itself from morning to evening and from summer to monsoon to winter, the Memorial will be a dynamic space which changes in tandem with the mood of the sky. The empty central space of the Memorial with the oculus above signifies the termination of the urban axis which begins at Rashtrapati Bhavan. The sky framed through the oculus along with the empty centre of the memorial creates a virtual axis connecting the earth and the heavens. The National War Memorial straddles Lawns 2 and 3, with the overall open landscape character of these lawns being retained as it is. The vast empty lawns accentuate the emptiness and the connection to the sky. On the north and south side, the lawn slopes down to the memorial floor level creating large amphitheatre like spaces which can be used for ceremonial occasions and solemn events. The Memorial is connected to the National War Museum via a subway at the northern corner of Lawn 2. An axial North-South path leads one from the subway exit to the National War Memorial. The subway exit is imagined as an active space, with stairs which take visitors through multiple levels of terraced seating before arriving on Lawn 2. The subway exit can also have a café which can utilise the terraced seating and activate the entire space. Such a café would be a welcome public amenity in the India Gate area. The gentle undulating shell roof of the Memorial acts as a vast shade structure, sheltering visitors from the heat and the rains. Borne aloft by the radial Memorial Walls which are inscribed with the martyr’s names, the roof becomes a symbol of protection – of the Armed Forces defending and protecting our nation. The elevation of the roof and the opening between the perimeter wall and the roof is designed to ensure that even in winter sunlight streams into the memorial space. 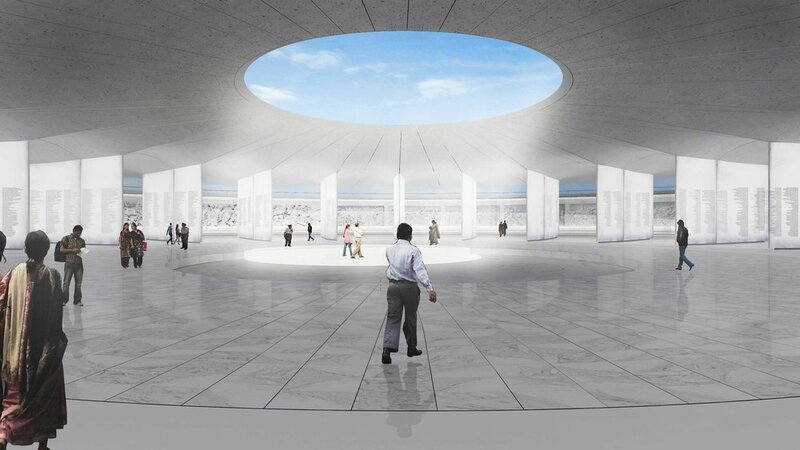 The main memorial space is bowl of diffused light sunk into the earth. The walls and floor of white marble and the ceiling of polished marble dust concrete will ensure that the entire memorial has diffused light during the day. 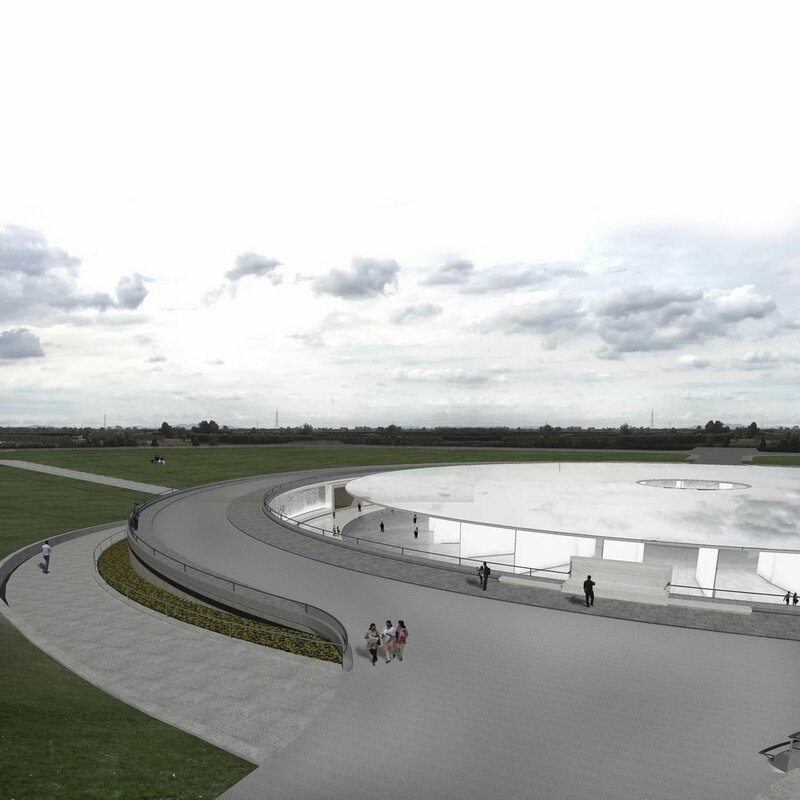 It will capture and reflect the natural light from the sky and make the memorial an ever-changing space. The glowing whiteness of the interior of the memorial will add to the solemn quality of the space.At night the marble Memorial Walls with the soldiers names, will be lit from within to create an ethereal glow. The soft light which diffuses through the marble will make the names appear to glow from within. 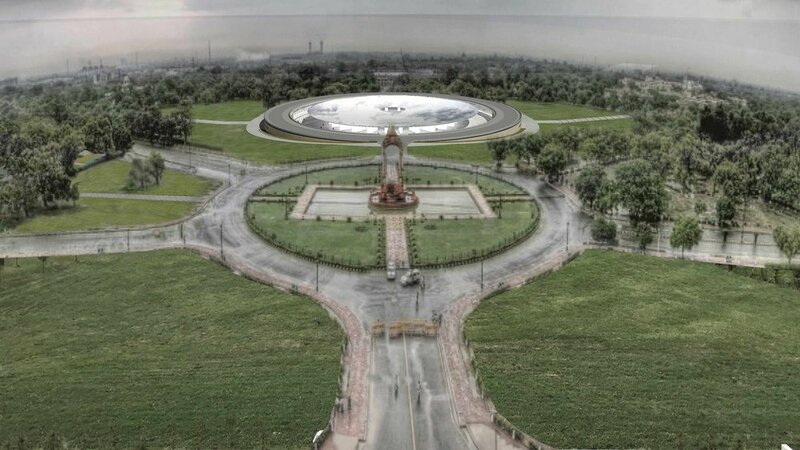 The twenty four radial Memorial Walls along with the oculus and the circular roof invokes the Ashok Chakra – an integral part of all national insignia and a symbol of peace.